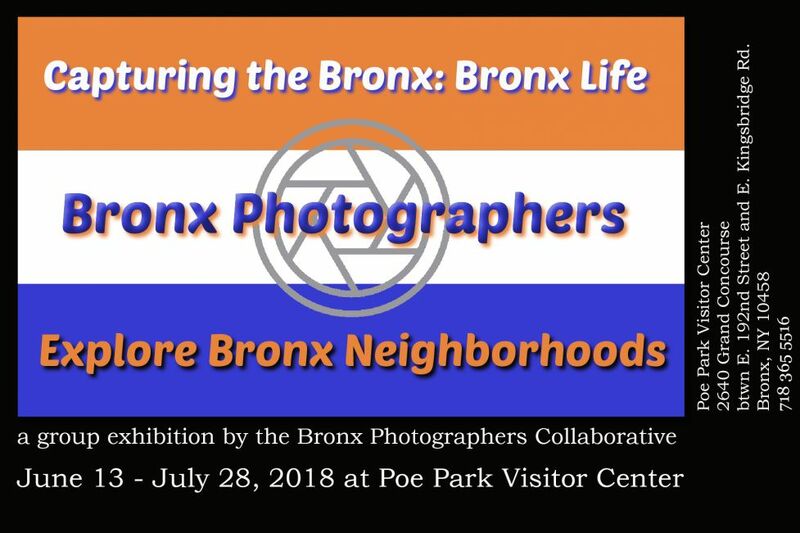 NEW YORK - May 25, 2018 - PRLog -- Capturing the Bronx: Bronx Life is part of an ongoing art exhibit and archival collection of the Bronx Photographers Collaborative. The neighborhood-themed exhibit runs from June 13 to July 28 at Poe Park Visitor Center, 2640 Grand Concourse, Bronx. The opening reception is Saturday, June 16, from 1 to 3:30 pm. Both the exhibit and reception are open to the public. All the photographers represented in the group exhibit are connected to the Bronx by birth, residency, work or affinity. According to the group's exhibit statement: "Each of us has a unique history, a particular point of view, and an evolving personal story. We believe that who we are as individuals and as a group is represented in this exhibit, but we also know that what is true today will be different, perhaps radically different, for us and for the Bronx in a few years or even a few months. This group exhibit is a work in progress. We are creating a photographic archive of the Bronx and all of its neighborhoods and will be mounting more and more exhibitions framed by different themes." Exhibiting photographers are Mitch Bleier, Silvia Blumenfeld, Dinorah Capota, Carol Foresta, Clarisel Gonzalez, Alex Krstevski, Fernan Luna, Eileen McNamee, Ira Merritt, Walter Pofeldt, and Miriam Quin. For more information about the Bronx Photographers Collaborative, http://www.facebook.com/bronxphotographerscollaborative. First Annual Women Entrepreneurs: Doing It Ourselves!